First things first: I want to give a special shoutout to Rob Kristoffersen, who’s been covering most of this initial season of “Helix.” He’s done a fine job, and in all honesty, he turned out to be right. I’ve been far more forgiving of this show’s flaws than many critics, and while I still think there are a lot of good ideas on display, Rob caught on before I did that the execution just couldn’t live up to them. Seriously, what just happened? You call that an ending? The first half of “Helix” was a promising blend of atmospheric horror and sci-fi twists; as far as “Lost”-style mysteries go, it set up a puzzle that was interesting enough to get by with a few weak characters. As the season progressed, though, it became an increasingly mixed affair, infusing some decent plot developments with lackluster melodrama. In “Dans L’ombre,” the writers tried to go out with a bang, but the result is a muddled, confused mess devoid of any suspense that’s far too vague to be compelling. The episode opens with a flashforward to Day 235. I guess I’m okay with that, as long the finale earns it (which it doesn’t, but I’ll get to that later). We then cut back to Day 13, in which Julia and Hatake are coping with the death of Daniel and trying to figure out why the hell her mother is alive and kicking. Again, I have no problem with her mother being alive, in theory. What I do have a problem with is the fact we were given no reason to care about her up until now. What happened to Jaye? Did Julia think she was dead? Did she just disappear? Why is she in a weird tank? Why does it take her a long time to realize how much time has passed? Why is she important? Was any of this mentioned briefly in an earlier episode and I just forgot? Basically: why should I care? The show dropped this new character in our laps like it was The Craziest Twist Ever without bothering to inform us why it matters. Later on, she gets her throat cut, so I guess it really didn’t. Why even include this subplot if it leads nowhere? Sergio spends the first half of the episode wandering around in the snow like an idiot just because Tulok yelled at him. He gets picked up by Scythe’s lady friend and promptly betrays her, only to reveal that what he really wants is a list of all the Inuit children who have been kidnapped over the years. It’s been 13 episodes, and I still don’t know what’s up with this guy. So he worked for Ilaria, but then radically changed his mind over the course of a couple weeks after meeting a pretty girl, and now he’s suddenly Mr. Sentimental? He’s a walking plot device, capable of switching loyalties any which way depending on whatever random obstacle the writers decide to throw in each week. And speaking of plot devices, one sure sign a show is stuck spinning its wheels is when it suddenly brings back really minor characters and has them serve an important function. I couldn’t tell you the name of the random doctor who does Sarah’s blood work if my life depended on it, but he apologies for taking her hostage earlier in the season, so that somehow makes him trustworthy. It turns out she’s pregnant. They still haven’t bothered to explain how the Immortals became Immortals and why Julia is an “abomination,” so I’m not sure how to feel about this twist. Will the baby be Immortal? Will Sarah be pregnant for all eternity now? Is she even alive by the end of the episode? The one twist that works in “Dans L’Ombre” is the reveal that Peter was working for Ilaria the whole time. It doesn’t make much sense (was this really all part of the plan? ), but it’s so ridiculous I was willing to overlook logic. “Helix” has always been at its best when it embraces camp, and few things have been as wonderfully cheesy as Peter “I Had Black Eyes And Controlled A Hive Mind” Farragut. You could tell me he’s actually Hatake’s father, and at this point I’d probably be willing to go with it. The problem with crafting a show that promises a complex mythology and constant puzzles to solve is that eventually you have to start providing answers, and if you haven’t set the stage for those answers, they’re not going to be satisfying. This episode felt like the sixth season of “Lost” compressed into 45 minutes—things just happen, not because they make sense, but because the producers are convinced that their top priority should just be Weird Stuff. There’s a fine line between compelling ambiguity and annoying vagueness, and “Dans L’Ombre” ultimately feels like too much like the latter. It’s fine to leave some questions unanswered, but after 13 episodes, we need to have at least a few concrete details about what’s going on. “Helix” doesn’t want to commit to anything definitive, and as a result what started off as a confident thriller ends up feeling entirely directionless. Scythe blows up the entire base, but outside of Jaye – who again, we’ve had all of 40 minutes to grow to care about – nobody is actually confirmed to be dead. The writers don’t even let us know which thermos of Narvik Julia managed to get to Alan before being flown away. In leaving all options open for next season, all the stakes are deflated. As a result, when we finally do return to the flashforward, it feels like we have even less context than we did before. I expected the show to completely change gears moving into the second season (you can only stay on an isolated base in Antarctica for so long before things get repetitive), but as we have no information about what the world is like over 6 months later, none of it feels related to what came before. Julia is apparently an Ilaria executive for some reason. Alan is either trying to find her or kill her. Peter’s true motivations are unclear. They were barely two-dimensional characters this season, so why should we care about their fate without any information whatsoever? 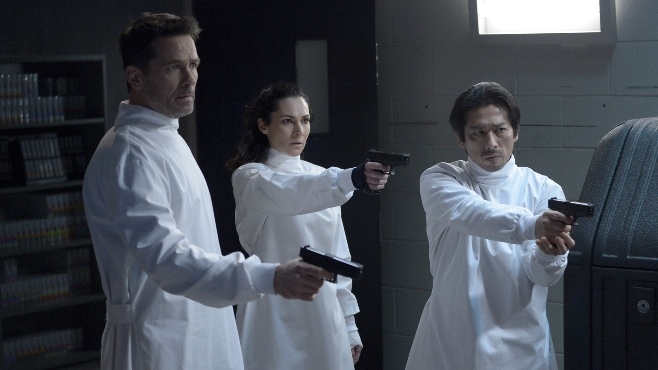 Overall, the first season of “Helix” wasn’t awful. It did, however, turn out to be incredibly disappointing, which might be the more frustrating crime. This finale was the weakest episode of the season; it’s so bad I might not tune in again next winter. On the bright side, I think I’ve figured out how Alan tortured information out of that Immortal on Day 235: he probably just turned on this show and asked him to follow along.